ABiCì stems from a conscious choice. ABiCì was born from the love for my daughter Giulia, and it is a message for future generations to whom we leave a planet and certain values that need to be defended. 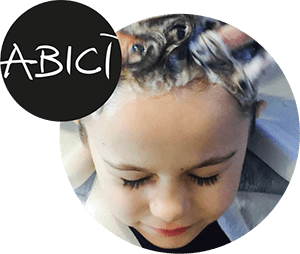 The respect of the environment is one of the fundamental principles that inspired the creation of ABiCì product line, rich with botanical ingredients, free from animal derived products and with a specific concern for sustainability, from ecofriendly formulations to sustainable packaging. I have personally followed the development of each single ABiCì product, choosing the textures, the ingredients and the scents, arranging a whole product line specifically conceived for children who have already stepped into this world but still depend on their mums’ choices as far as body care is concerned. All formulations were developed by researchers in the cosmetic field within the prestigious University of Siena and are the result of the work of an exceptional group of people made of creative minds who share my vision and my values, and of other conscious mums who feel my same needs. For our children, we have created safe products, free from hazardous chemicals, suitable for their skin and conceived for their daily moments of well-being. Precious moments that are shared with those who take care of them and will be forever part of their memories. Ultimately, ABiCì is a wonderful story written by conscious parents, where children are the main characters and our planet is the beneficiary.